Staff in the shop are always really polite and helpful, really friendly guys all round and have not been disappointed with their quality of work, will always go back to them! This website, www.exquisitefireplaces.co.uk, is operated by Exquisite (‘we’ or ‘us’). These Terms and Conditions apply to all transactions on this site, whether you are ordering online or by telephone. Please read them carefully. They do not affect your statutory rights. Using this site indicates your acceptance of these terms and conditions. Placing an order indicates your acceptance and the terms listed are subject to change at any time. Any changes will take effect on the date they are posted onto the site (see the date above). Please read them carefully and print a copy for future reference. 1.1. To order goods over the telephone or on our website, you must be at least 18 years of age and accept delivery within mainland UK. 1.2. All telephone orders will be acknowledged verbally at the time of order, and all orders placed on our website will be acknowledged electronically by e-mail. Please note that verbal and/or electronic acknowledgements do not constitute order confirmation or order acceptance. Your order will be accepted and the creation of a legally binding contract between you and us will take place once the order status has been confirmed as ‘Order Placed’. (Alternatively, we may decline all or part of your order for any reason, in which case we will inform you in-person, by telephone or e-mail). 1.3. We accept all major credit and debit cards including Visa, MasterCard, Switch, Solo, Electron, Delta and all credit cards will be charged at 2.5% extra on top of the purchase price. You may also pay by cheque or postal order (payable to: exquisite) although we cannot dispatch the goods until payment has been cleared which can take at least 14 days. BACS/CHAPS payments are also accepted. 1.4. The total price payable will be stipulated at the time when you place your order whether or not the order has been acknowledged. We are entitled to make adjustments to the price to take account of any increase in our supplier’s prices, or the imposition of any taxes or duties, or if due to an error or omission the price published for the goods is wrong whether or not the order has been acknowledged. We will inform you of the correct price and give you the opportunity to cancel the order. All prices are inclusive of VAT but exclusive of delivery charges which will be payable as indicated at the time the order is placed. 1.5. Prices, offers and products are subject to availability and may change before (but not after) we accept your order. If a product becomes unavailable we may offer you an alternative and and give you the opportunity to cancel the order. Our prices are constantly under review and occasionally a supplier may reduce their prices due to excess stock or a special offer. We cannot be held responsible and no refunds will be given, if, after purchasing an item, it is later offered at a reduced price. 1.6. All product specifications, images, descriptions and other information communicated by us, whether displayed on our website or communicated over the telephone, have been made accessible by suppliers, manufacturers, publications, publicists and/or gathered from public domain sources. Our intention is that all information should be as accurate and up-to-date as possible. However, just occasionally we make or discover an error in the price or description of a product; as such we cannot guarantee the reliability or accuracy of the information communicated. If we discover such an error on a product, which you have ordered, we will inform you as soon as possible and ask whether you wish to continue with your order or cancel it. 1.7. Full product details are available from the manufacturer’s brochures or their websites. All accessories supplied with a product are subject to upgrade or change at the manufacturer’s discretion. We will supply the product as supplied to us by the manufacturer. All product images, descriptions and dimensions are offered as a guide only and are subject to change at any time by the manufacturer. Do not rely on the product dimensions or images shown on this site for installation preparation. All gas fires are suitable for natural gas only unless an LPG option is specified. 1.8. You must provide us with your exact billing address and telephone number when placing your order; this is the address and telephone number which your credit or debit card bank has on file for you. Your order will only be processed once authorisation of your credit or debit card has been properly received. We may occasionally ask for proof of address such as a recent utility bill, passport or driving licence. 1.9. All goods and services are subject to availability and may be withdrawn at any time. If we do not supply the goods for any reason we will not charge you for these and we will refund any money already paid for them. However, we will not be responsible for compensating you for any other losses you may suffer if we do not supply the goods. 1.10. We will make every effort to keep your details secure and we will not supply or sell any customer details to any outside organisation or third party at any time. Unless we are negligent, we will not be liable for any losses if an unauthorised third party obtains access to your information. 1.11. All items are subject to availability. We can only guarantee availability whilst stocks last. If the goods ordered are unavailable, we will contact you with suggestions of alternative goods of equivalent quality and wherever possible a similar price. 1.12. A small number of images on this web site may have been digitally created to represent a colour/option of a product where no actual image exists. All images, descriptions and specifications are offered as a guide only and we strongly recommend viewing the products prior to placing your order to avoid any misrepresentation. We shall not be liable for any losses, costs, damages, charges, or expenses caused by goods not meeting customers expectations. 1.13. It is the customers responsibility to ensure that products purchased conform to all necessary installation requirements stated in manufacturers instructions prior to ordering. We shall not be liable for any losses, costs, damages, charges, or expenses caused by goods not suitable for installation. We strongly recommend having a survey carried out prior to ordering and contacting the manufacturers technical department for any questions you may have. 1.14. Exquisite reserves the right to refuse the supply of goods at its discretion ordered by you or to deliver to any particular postcodes. 2.1 All prices are exclusive of delivery charges to most areas in Mainland United Kingdom. A charge is made for the delivery of goods to remote areas and we endeavour to keep the charge as low as possible. 2.2. Delivery is to Mainland UK only. Unfortunately, we do not make overseas deliveries. However, it may be possible for you to make your own collection arrangements in you live outside of Mainland UK. Please contact us for further information. 2.3. We will only deliver goods to the billing address on the order. 2.4. We carry our most popular products in stock. We always quote 10 to 15 working days (not including Saturdays, Sundays or public holidays) Delays in delivery of goods is sometimes outside our control. As such, delivery cannot be guaranteed and any dates we specify for the delivery of the goods are approximate only. We shall not be liable for any losses, costs, damages, charges, or expenses caused by any delay for delivery of the goods. If we or our suppliers are temporarily out of stock or the item ordered is a special order, we will notify you of this position and you should allow up to 28 days for dispatch of the goods. 2.5. If you require your products by a specific date, provided we are able to obtain the products we can arrange an express overnight delivery for an additional charge. Please add this information into your delivery instructions when placing your order. 2.6. Please note: The delivery cover ground floor only with a one man delivery, if you have any special requests for delivery (for example if you live in a flat) please make us aware of this at time of purchase and we shall endeavour to arrange a special delivery for you, this may come with an additional charge, please contact us for further information. Certain items will be delivered on a pallet. In these cases, the driver is only available to leave the item outside your house. You must make your own arrangements for unpacking the pallet and taking the product into your home. 2.7. If you are unable to accept delivery on the day we have agreed, please notify us as soon as possible and at least 24 hours ahead of the planned delivery day. If you do not notify us within this time and we were unable to deliver the goods to your home on the day that we agreed and scheduled, we reserve the right to charge a second delivery fee. 2.8. You should examine your goods as soon as reasonably practicable during and after delivery to check for any damage or missing items or parts. If you receive goods in a damaged condition or missing parts, please make a note of this on the dispatch note, you will need to notify us of this by phone, email or letter in any case within 3 days from receipt of goods. 2.9. If you find any damage or discover that parts are missing after delivery, you must contact us as soon as reasonably practicable. We will not accept liability for any claims for goods which are damaged, incorrect, shortage or with missing parts which are not notified within a reasonable time after the goods were delivered. 2.10. Where goods have been ordered without the required accessories to install the goods purchased, e.g. a spacer kit for a electric fire or flue pipe for a stove, we cannot be held responsible for this and a delivery charge will therefore apply. We would strongly advise you to ensure you have everything you require before proceeding to purchase any goods from us to avoid unnecessary additional costs thereafter. 3.1. Orders placed on this site can be collected once notification has been given that the goods are in stock. 3.2. You must provide a telephone number if you choose to collect your goods. We may call you to ask whether and when you intend to collect the goods. If we are unable to contact you we may stop holding the goods available for you. 3.3. Once you have been notified that goods are ready for collection, they must be collected within 7 working days from the date of notification. You will need to take the credit or debit card used to make payment along with an official form of identification, which verifies your name and address such as a bank statement, driving licence or utility bill. On arrival, please present your identification and reference number to the warehouse manager or sales representatives. 4.1. exquisite does provide a fitting service at an extra cost but purchasing goods from us does not guarantee we will fit the item(s). 4.2. Installation of gas fires requires a Gas Safe registered engineer and any electrical work must be carried out in accordance with current regulations. 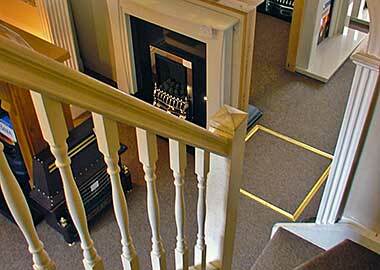 Gas Safe regulations require its members to work to recognised standards. DO NOT ALLOW ANY NON-GAS SAFE REGISTERED PERSON TO INSTALL THE APPLIANCE. This is likely to lead to damage to the appliance and invalidate the guarantee. 4.3. We strongly recommend that you do not book fitters for your appliances until you have received and inspected your goods. We shall not be liable for any losses, costs, damages, charges, or expenses caused by any delay for delivery of the goods. 4.4. We shall not be liable for any losses, costs, damages, charges, or expenses due to damaged items once installation of your products has commenced. This also includes incorrect or missing parts. 4.5. Manufacturers instructions and current gas and electric regulations must be followed exactly when carrying out any installations. Failure to do so may result in invalidation of warranty, call-out charges for service calls and serious compromise on safety. 4.6. Most fireplaces, fire surrounds, back panels, hearths and inserts are not supplied with manufacturers fitting instructions. The fitting of a full fireplace requires a competent installer who is familiar with the various options of building work required to suit each individual installation. We strongly recommend using the services of a installer who has experience of fitting fireplaces as each installation will vary. 5.1. If you are not totally satisfied with your goods for any reason, you have the right to cancel your order within 7 working days from date of delivery or collection for credit or refund provided that you return the goods at your cost as sold in pristine condition in their unopened original packaging with all components and accessories. Goods must be complete, unused, and in as new condition; for example, if you have opened the box to examine the product it must have been done so without damaging the box and packaging or damaging the product in anyway and must be repackaged as received. 5.2. Prior to retuning any item(s) we must receive email confirmation of your request to return and the reason why you wish to return the product. 5.3. When returning products you must ensure you use an insured delivery service to return any items, we will not be liable for any damage caused by the courier on the return journey. All returned items will be checked in front of the courier and any damaged items will be refused. 5.4. When we receive the goods we will inspect them to ensure all manuals, accessories and other components are within the returned package and that the goods are in the condition that we sent them to you. If we receive a returned item that is not in the condition we sent it or has missing components we reserve the right not to issue a refund. 5.5. Please note, special order and bespoke items may carry administration charges upon return at any time. 5.6. Exquisite will not accept liability if a product is not suitable for your chimney or flue. We strongly recommend that all customers view the product before ordering and have a survey carried out by a professional installer to check that the product is suitable prior to placing their order. 5.7. We are unable to accept the return of goods specially ordered to the customer’s specification. 5.9. All replacement products or parts must be paid for in full. If the original product/parts were sent out due to Exquisite error or if they were damaged/faulty, a refund will be issued on their return. *this fee may vary dependent on the number of items and type of product being returned but will be greater than the original delivery fee. 6.1. Full refund of the cost of the goods is wholly conditional upon the above conditions being met and the refund authorised only after a full inspection of the goods by the relevant department. If goods are returned in a condition, which prevents them from being resold as new, we are unable to accept the return. You will not be refunded and the goods will be returned to you and the cost of delivery charged to your account. 7.1. If you suspect that your goods have developed a fault, first check that the problem is not something like a blown fuse on a electric fire or soot deposits on a gas fire pilot. Check the manufacturer’s manual, specifically the fault finding/troubleshooting section to see whether you can resolve the problem yourself. Also, locate the manufacturer’s helpline number and call to find out if the manufacturer has its own repair procedure. We shall arrange for either a replacement product or replacement parts to be supplied free of charge. These parts will be delivered to you at our expense and the faulty item shall be collected. A full refund – providing the item has been verified by a qualified engineer as being faulty, we shall arrange for the item to be collected from your property and a full refund given. If we find that the item has any accessories or components missing we shall carry out the refund and take out a fee to cover any costs. If your item becomes faulty after having been fitted for more than 28 days, please contact ourselves directly to arrange a prompt service call. 7.3. We will reimburse any amounts you have paid to us within 30 days of return of the goods, having deducted any return, repackaging or retrieval costs and administration fee if applicable. 7.4. Please note, any faulty items have to be seen by an authorised engineer before any action can be taken. If your goods are not found to be faulty, a call-out charge may be incurred. 7.5. All goods supplied are covered by the terms and conditions of the manufacturer’s guarantee for a minimum period of 12 months. This guarantee specifically excludes faults caused by accident, neglect, misuse or normal wear and tear. 7.6. Gas fires will produce some levels of carbon soot which is produced when the flame impinges on the fuel bed of the fire. This will be more apparent on lighter fuel beds such as pebbles and driftwood. This could begin to happen as soon as the fire has been installed. The is not a fault with the fire and in no way affects the performance of the appliance. Regular maintenance such as removing the fuel effect and lightly brushing the carbon deposits off should help. We shall not be liable for any losses, costs, damages, charges, or expenses should this occur. 8.1. In order to prevent unauthorised access to the data, which you have provided to us, we follow strict security procedures in the storage and disclosure of information. From time to time industry regulators and our auditors may require us to disclose some or all of the information for legal or regulatory purposes. 8.1. Under the Data Protection Act, you have the right to see any data that we hold about you and to object at any time to the use of your data. We hold data to primarily validate delivery details and manufacturer warranties. We may, at a future date, wish to contact you with selected product offers, which we think, may be of interest to you. If you would prefer not to receive such offers or wish to know what data we hold against your name, please write to our Customer Service Department, Exquisite, 208 Main Street, Bulwell, Nottingham NG6 8EH. This guarantee is in addition to any warranties or conditions implied by law. Nothing in these terms affects your statutory rights. All contracts formed between us for the purchase of items from this Web Site shall be governed by English law and any dispute shall be subject to the jurisdiction of the English Courts. If any provisions of these terms and conditions shall be unlawful, void or for any reason unenforceable then that provision shall be deemed severable and shall not affect the validity and enforceability of the remaining provisions. Trading Address: 208 Main Street Bulwell Nottingham NG6 8EH.